You’ll go back in time 165 years when you take in By All Accounts: The Story of Elmhurst at the Elmhurst History Museum! The entire second floor of the museum has been turned into an interactive exhibit so you can journey through the city’s history. This ongoing exhibit features a variety of photos and objects from the museum’s collection. These History Spotlights are updated regularly so there’s always something new to see. All of us at Elmhurst Toyota encourage you to check out this exhibit and learn more about our remarkable city. One of the most interesting parts of the exhibit is the award-winning, interactive map of Elmhurst that explores the city’s past and present. This tabletop map was featured in the Chicago Tribune’s guide called “50 Museum Marvels” in July, 2017. Currently, the museum is showcasing objects from the Elmhurst-Chicago Stone Quarry, which was one of the city’s first businesses. Started in 1883 by the Hammersmith family of Elmhurst, the quarry was the source of limestone used in many local buildings and roads. The Elmhurst History Museum was founded in 1957 and is located in the historic Glos Mansion. A department of the City of Elmhurst, it’s supported by the Elmhurst Heritage Foundation. It houses a robust collection of over 10,000 historic photos, a library of over 500 books, decades of city records and more than 15,000 objects and artifacts. 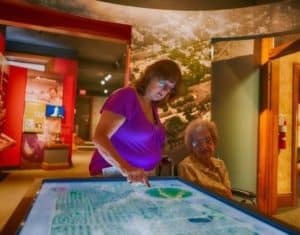 The museum offers many resources to connect residents with history, including gallery tours and exhibitions, special events, workshops, living history programs and more. Even if you’ve seen By All Accounts: The Story of Elmhurst before, the exhibition has been updated with new and interesting information about the city. You don’t want to miss it! Tuesday through Friday: 1-5 p.m.